Announcement Now there are even more ways to enjoy Artcmom Inspirational Art! 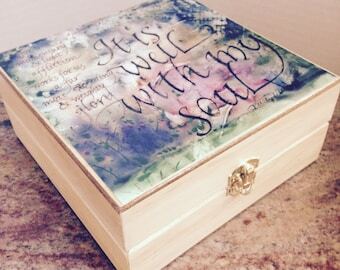 Collect Framed Canvas Prints, Essential Oil Boxes, Jewelry Boxes, Mugs, Memory Boxes & more! Artcmom Artwork makes a memorable & treasured gift. Consider having your own art idea made... What milestone gift needs do you have coming up...a birthday, graduation or anniversary or even something special for yourself? A mission statement for your office, a favorite quote, verse, song or poem, can be created for you by Artcmom. Let's dream something up together! Now there are even more ways to enjoy Artcmom Inspirational Art! Collect Framed Canvas Prints, Essential Oil Boxes, Jewelry Boxes, Mugs, Memory Boxes & more! Artcmom Artwork makes a memorable & treasured gift. Add Artist Enhancement to any canvas print, up to 24" x 30"
Families Magnolia Psalm 68 He sets the Lonely in Families. Oh.My.Goodness. This box is so very beautiful. Keli went above and beyond to incorporate my special request. I can’t wait to give it to my daughter. Keli’s work is exquisite, her communication was great. I’m very happy with my purchase. My Redeemer Lives!!! - What a Beautiful and Wonderful work of Art! - I will Enjoy it every day! - Thank You SO Much!!! 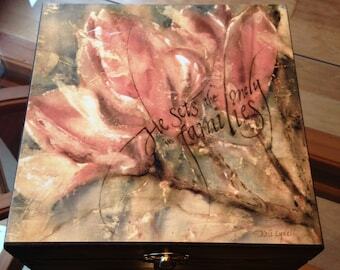 These Beautiful Memory Boxes were gifts for my children for Easter! - They are Lovely and will be a reminder always that - My Redeemer Lives! - Thank You SO Much!! !